The preview of the Whitney Biennial was great and all. But did those uptown swells lay out endless garbage cans filled with free PBR at THEIR opening? Did they toss out free t-shirts to a rowdy, adoring crowd? Was there Ministry on the decks and naked people on the floor? And were there almost 600 different artists with works hung literally floor to ceiling, every square foot filled, every single one of them created by a woman? No? Ok, then: Welcome to the Brucennial, now in its fifth and, as it turns out, final iteration. Running through April 4 on Washington Street in the Meatpacking District (right in the shadow, in fact, of the under-construction new Whitney) The Last Brucennial 2014 is messy, sprawling, epic, raunchy, cute, angry, funny, boring, sharp, smart, not to be missed. Curated (loosely speaking) by the art pranksters at Bruce High Quality Foundation, the Brucennial has grown bigger and louder (and moved steadily westward) since its slapdash beginnings in 2008 on the Bushwick/Bed-Stuy border. But even though these days there are some pretty famous artists hanging among the hundreds (Marina Abramovic, Swoon, Barbara Kruger, Jenny Holzer) the vast majority of works at the Last Brucennial were done by women you’ve likely never of. Just a ton of local working artists painting, shooting, sculpting, assembling, creating amazing and interesting things. 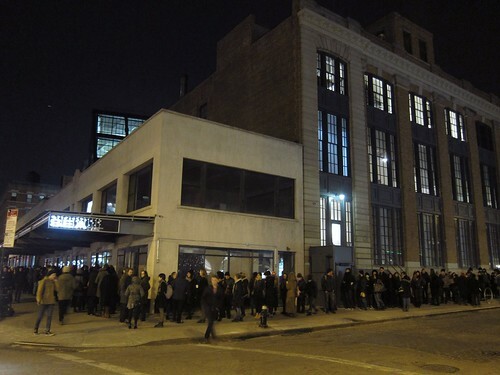 The opening of the Brucennial last night was packed, with a line way around the block (even the VIP entrance had a waiting pen! ), and there was so much art on display there was no way to absorb it all in one go. 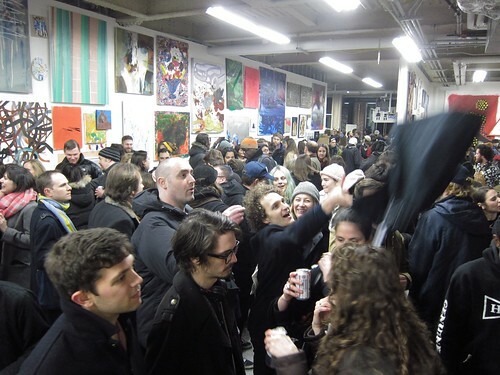 But the party was a blast, the mood was beer-fueled and super-festive, with lots of artists posing next to their pieces and LOTS of flirting and laughing and cool clothes and general goofiness. Going out with a bang indeed, Bruce High Quality Foundation. See you around campus! The Last Brucennial, on the corner of Washington and West 13th Streets, through April 4, Wednesday to Sunday, noon to 6:00 p.m.